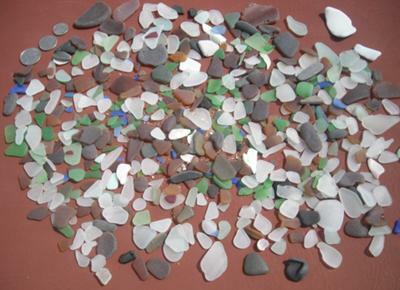 Many different kinds of sea glass: usual & unusual colors; frosted, clear; smooth & sharp edges. Cup-fulls per hour. Wow! That's a really nice sea glass find! Wish we were there. I have been collecting sea glass in this area many beaches and have tons of it! You have to understand that tides make a difference on how much washes ashore,sometimes it's amazing,others not.keep trying! We were in Dorado and found some good glass. I want to go to Rincon next trip - where did you stay and was it nice? We spent 5 weeks on Sandy Beach in Feb/March this year & it was terrific for glass. We had so much that we had to send two boxes home by mail...22 lbs.!! I have started making jewlery & having a great time. Can't wait to go back to Rincon next year.